It’s opened with quite a buzz but is this Spanish restaurant the real deal? Paprika, cayenne, cloves, nutmeg, lashings of salt – Spanish cuisine is all about bold flavours that favour punch over nuance, and that’s what you’ll find at Toro & Ko. 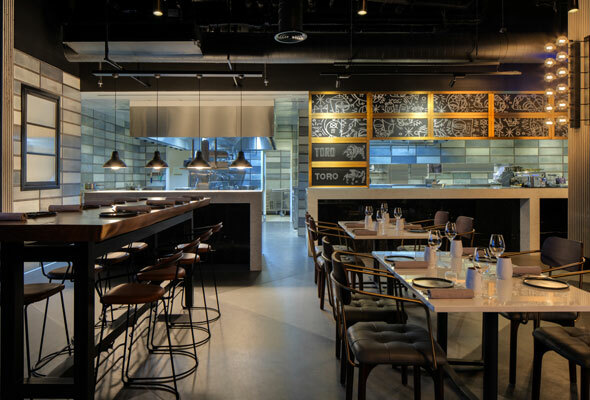 Tucked away behind the fairy-lights and olive trees at City Walk’s new fine-dining courtyard (which is also home to Lima and Galvin), Toro & Ko is all about tapas. We visited on a Tuesday night, it was relatively humming, and with eyes bigger than our stomachs we ordered far too much. 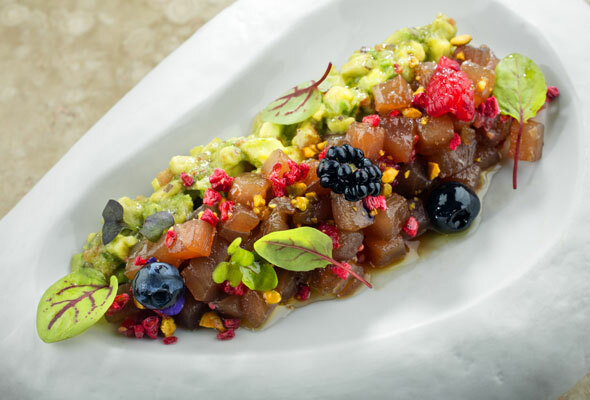 Our top dish was the tartar de atun (Dhs82), the plump pieces of fresh tuna and avocado contrasted nicely against the sweet punch of berries. Another favourite was the simple pan de cristal (Dhs36), which was basically crunchy toast with olive oil, a fresh tomato spread and garlic cloves (rub all three ingredients against the bread to create the ultimate comfort food). The patatas bravas (Dhs44) are posh and deconstructed (the spicy brava sauce is hidden inside the spherical potato) – and, while we appreciate the artistry, we’d be just as happy with a big bowl of hot potatoes. The most divisive dish of the night was the sea urchin with Seruga caviar and quail egg (Dhs92 for effectively a spoonful). If you love caviar, and the slipperiness of sea urchin, you’ll appreciate this. Our dining partner did not: “I feel like I’ve just licked my hand after I’ve been sitting in an ocean rockpool, and paid a lot for the privilege”. For the main event, you have to try paella: the kitchen at Toro & Ko are proud of how close they get theirs to burnt – any aficionados of the Spanish rice dish will know that the almost-burnt, caramelised rice called ‘soccarat’ is the key to a good paella. We tried the rabbit, chicken, white beans and artichoke paella (Dhs186), and mopped up the sticky, gooey, slightly-charred rice (although we imagine some people will just consider it burnt). To end, we couldn’t go past the churros (Dhs46), which featured a perfectly doughy centre, and an unusual miso dulce de leche (umami and sweet all at once). Meanwhile the cold rice pudding with cinnamon sugar and a blood orange slushie (Dhs38) is something we’d only recommend to extreme rice pudding fans. Verdict? The flavours are punchy, the vibe is good, the cocktails are interesting and the drinks list well-curated – we’ll be back to Toro & Ko, but probably for drinks and nibbles (that tomato toast is still on our mind) rather than a full-on sit-down meal.